This mid-October, myself and a small group of friends will be running the Grand Canyon Rim to Rim to Rim (R2R2R). This post is originally written as information for that group but I am publishing it on the blog because I believe that it will also be useful to anyone planning a Grand Canyon R2R2R or just a R2R. Safety First! Running or hiking R2R2R, or even R2R, is not recommended by the US Park Service. Of course, plenty still do it every year. However, it is a strenuous activity that involves significant climbs, uncertain water sources, and potential hot and cold weather. Know yourself, your abilities, and your training. There is no way out of the canyon other than the rims or a very expensive emergency search and rescue or helicopter evacuation (you don’t want that). There is no shame in getting there and deciding to shorten your run/hike. Be prepared to back out and return early if you start down the canyon and are overwhelmed. Be prepared to stop and wait at the bottom for the group’s return if you feel that you can’t make it up the North rim. Be prepared to wait a long time for a shuttle at the North rim if you feel that you can’t make it back. More on this in the emergency options section. Permits: We are running as a group of friends and not as an organized tour or trip. Thus, we are running without a permit. In 2014, the park began requiring permits for groups that advertise to the public or compensates the organizer. The park also created a preventative search and rescue team, or PSAR, that is dispatched into the canyon to provide hikers or runners with information regarding trail and weather conditions, as well as salty snacks and electrolyte beverages to visitors in need. They might ask what you are doing. Tell them that you are doing R2R2R with a few friends. There will be a fee to enter and park in the park. Timing: The best times to complete a R2R2R are spring and fall. I choose mid-October because it would be cooler than September and before November snows. Water could still be on, although that is not guaranteed, and our date includes a weekend when the North Rim Lodge is still open in case of emergency. Route: We will be running/hiking the Bright Angel trail from the South rim and and North Kaibab Trail to the North for a total of 46.6 miles round trip. The Bright Angel Trial is a bit longer than the South Kaibab alternative, but is less steep and has more water options. There is an option to visit Ribbon Falls off of the North Rim. This adds about two miles. I’m inclined to save that for another trip, but who knows? You will be at altitude at times! Elevation at the South Rim: 7,200 Elevation at the North Rim: 8,240 ft. It is 2,400 at the bottom. Total elevation gain up the North rim: 5,740 ft. Total elevation gain up the South rim: 4,340. Total overall: 10,080 feet of elevation gain. You are looking at climbs as long as 8 miles with significant climbs as long as 6 miles. Be prepared for 14-21% inclines. The route includes steep drop offs, narrow trails, rocky technical terrain, and multiple bridges. Expect the trip hiking with some running to take around 16-18 hours. Slower if stopping for extended rests or if visiting Ribbon Falls. Running more often will shorten it. My plan is to not rush things and enjoy the time in the canyon. Stop and take breaks when you need them. This is not a race! Our current plan to leave the hotels at 3:30 am and start running at 4:00 am. Mules start down at 5:00 am, so we want to be ahead of those. 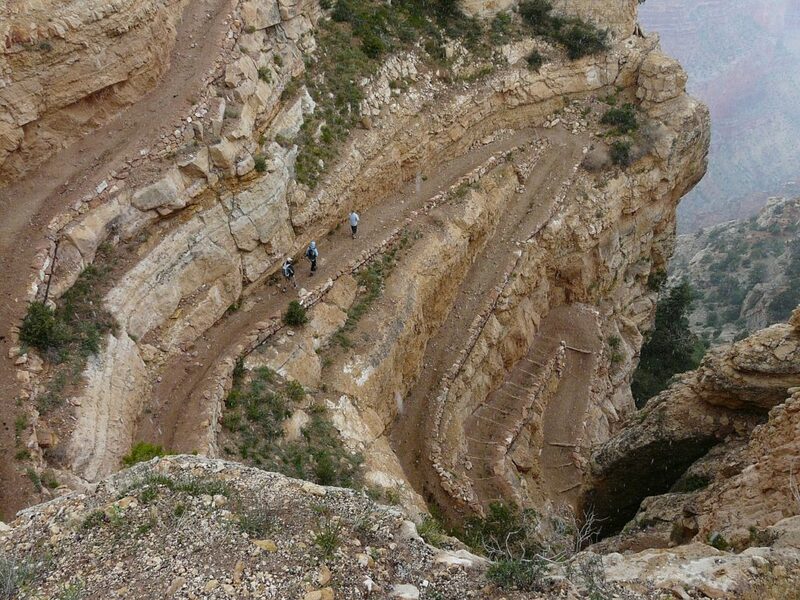 Normally the mules use the South Kaibab trail more, which is another reason to use Bright Angel instead. Weather: Average Temperature in mid-October for the South Rim is a high of 64 and a low of 33. At Phantom Ranch it is 82 and 57. “The box” section past the ranch could be as high as ten degrees more. North rim average is 57 and 30. So obviously preparation for both hot and cold is required. Current and historical weather conditions are available here through the National Weather Service. Water: The route has water stations. HOWEVER, there is no guarantee that these will be operational. The pipeline breaks often. In fact, as of this writing, much of the entire North Rim trial has the water off due to a line break. Water also can be shut off in mid-October for the season. This makes bringing a water filter system mandatory. Recommended is the Sawyer mini system, which can pump into a bottle and can also be used direct from the source. Hydration pack adapters allow for filling bladders. Water sources from creeks are rather abundant along the north rim. Additional water treatment tablets in case of malfunction of the filter are a good idea. There are also several sources for filtering on the south. Before departing, check the Park Service Critical Updates Page for water status and closures. Be prepared to carry at least 2 liters of water and never run dry. If getting low, filter water even if you believe that an operational water station is coming up. Indian Garden: This is normally on year round. Bright Angel Campground: Normally year round water. Phantom Ranch: Year Round water. The Phantom Ranch Canteen is open to the public during October from 8:00am to 4:00pm and 8:00pm to 10:00pm. It sells a small variety of hiker items including snacks, beverages, stamps, T-shirts, postcards, headlamps and first-aid supplies. There is also a ranger station here who could provide help in an emergency. North Rim Lodge: This is an additional hike of a couple of miles. There is a store and restaurant at the lodge. Plan to go there only if trying to get the shuttle or if there a significant rest is needed without worry about return time. There is a general store closer than the lodge at the campground. North Rim emergency water if the pipeline is off: Administration and Backcountry Information Building.4 miles west from the trailhead. Head left/west on the dirt trail (forest service road width) up the hill through the trees. About 200 yards ahead the trail turns left again (south) and meets up with the main paved road. Cross the road. You are now on Bridle Trail (which you can take all the way to the North Rim Lodge or Bright Angel Point and may be a shortcut to the lodge). Take the side road west for another 100 yards or so, and make a left at the first opportunity. The water station will be on your left in front of the Admin building. Calories/Fuel: Be prepared to carry enough calories with you for 20 hours worth of hiking. Nutrient and calorie dense items are recommended. Also carry electrolytes. I plan to carry Belvita bars, Larabars, trail mix, gels, and Tailwind. My goal is to have at least 2000 calories on me in the form of real food, plus tailwind. If timing is right, extra food might be able to be obtained at Phantom Ranch, but don’t count on it. Pack. I am considering buying this Ultimate Direction pack for more space for R2R2R and for Bigfoot 200 the next year. Water: Minimum 2 liters of water, 2.5-3 liters recommended. Water Filter, Water treatment tablets also recommended. Headlamp and extra batteries. Backup light source recommended. I use this penlight as a backup or in addition to my headlamp. Fuel for up to 20 hours of activity if mostly hiking, 16 hours if running. Electrolytes are also highly recommended. Appropriate clothing: Be prepared for cold weather on the rims and hot weather in the canyon. Long sleeve, tank or short sleeve, light wind/rain jacket, gloves, buff, hat, and extra socks are suggested. I plan to carry or wear compression sleeves. Money and credit card for Phantom Ranch or North Rim and/or for emergency shuttle. Phone: But don’t expect to have service. Hiking Poles. I swear by these collapsible ultra lightweight poles. Basic first aid items: suggested items area blister kit, bandaids, anti-chaffe cream, lip balm. I plan to take a compression ankle sleeve in case my ankle flares up or I get a sprain. Emergency Whistle (most running packs have this). Ultimately everyone has to take responsibility for his or her own safety, and I can’t force rules on anyone, but here are general rules I would like to see followed, plus some general information. I will be carrying a Delorme InReach (Garmin now owns this company, so you will see Garmin branded ones as well) which has satellite messaging capabilities and will allow for tracking. I intend to play “sweeper” by being the last person so that if anyone runs into trouble, I will either come across them or see them when they turn back. Linda is my sweeper backup. Anywhere before Phantom ranch or “the box”, if a person wants to turn back on their own, this is acceptable if their buddies declare that they are physically able to make it back. If they want to go to Phantom ranch for a rest and to buy items first, that is fine. When that person reaches me, if not already with me, I will use the DeLorme to message the people at the rim so they know to expect a pickup. After reaching the “the box” past Phantom Ranch, if a person wishes to cut the trip short having gone as far as “the box” they must either return to Phantom Ranch and wait for the group to return to pick them back up, unless they are accompanied by a buddy, in which case they can return the entire way. If close to cotton wood camp, they will wait at cottonwood camp. If past cottonwood camp, they will wait at the next working water stop. No waiting at areas without shade and the ability filter to otherwise obtain water! If in doubt that your buddy or remainder of the group will make it back, keep moving to the North Rim! North Rim: A person may hike to the North Rim lodge to attempt to catch the shuttle. And that leads us to….. Shuttle Information: The TransCanyon Shuttle departs the North Rim at 7am and 2pm. You are not guaranteed a seat without a reservation, but can get on the shuttle if it is not full. For insurance, you may wish to consider purchasing a spot on the 2pm shuttle. This would require completing R2R in about 9 hours (allowing another hour to get o the North lodge). That is $90. 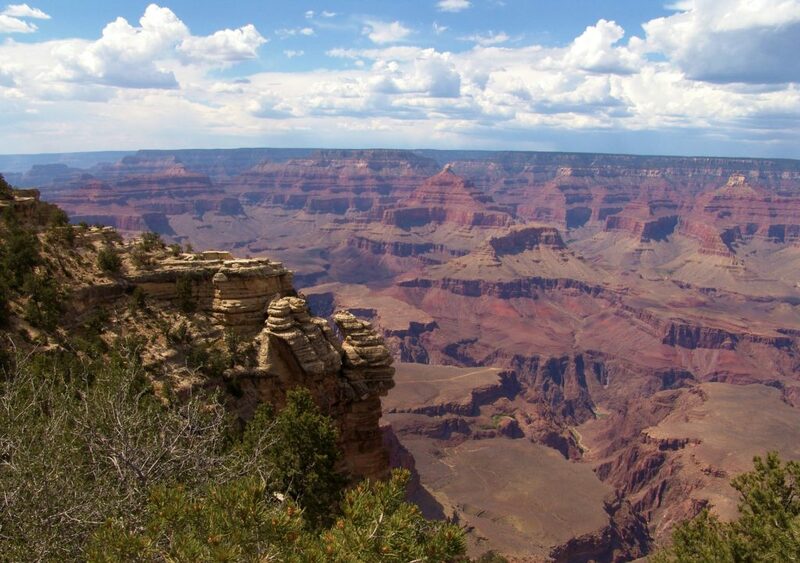 You could also call and reserve the 7am shuttle the next day upon arriving at the North Rim. The lodge at the time of this writing did not have any rooms available. Would they let you sleep in the lobby? I don’t know. I have read that hitching a ride from the trail head to the lodge is easy. I have also read of some hitching the whole 5 hours back to the south rim! I plan to watch the lodge for cancellations up to the day of the trip and might book a room as insurance if one opens up. Let’s Have A Safe, Fun Trip! Liz Thomas Hiking R2R2R: A really good overview of a R2R2R hike with useful comments as well. Tips of Running R2R2R: Some good basic tips. Runner’ Guide to the Grand Canyon: From Competitor Magazine. Running the Grand Canyon: From Trail and Ultra Running. Jedi Runner Page with good maps: Not the best formatting, but very helpful. Grand Canyon R2R2R Run Facebook Group: Lots of great info! Grand Canyon Hikers Facebook Group. All photos are creative common licensed via Pixabay.